Example of several unipolar neurons from a nerve ganglion of a velvet worm (a primitive arthropod). The neurons were stained for serotonin immunoreactivity, and photographed using a confocal microscope, with multiple images overlaid and color-coded according to depth. 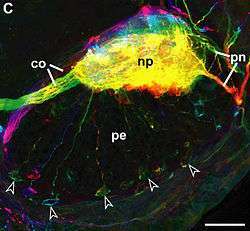 Arrows mark the peripherally located cell bodies of several neurons, whose neurites extend into the central neuropil (np), where their complex ramifications are indiscernible. Scale bar: 50 micrometres. A unipolar neuron is a type of neuron in which only one protoplasmic process (neurite) extends from the cell body. Most neurons are multipolar, generating several dendrites and an axon and there are also many bipolar neurons. Unipolar neurons that begin as bipolar neurons during development are known as pseudounipolar neurons. Unipolar neurons are common in insects, where the cell body is often located at the periphery of the brain and is electrically inactive. These cell bodies often send a single neurite into the brain; however, this neurite may ramify into a large number of branches making a very complex set of connections with other neurites, in regions of neuropil. Unipolar brush cells are neurons specific to the cerebellum and the granule region of the dorsal cochlear nucleus. In all species, including vertebrates and invertebrates, many types of primary sensory neurons are pseudounipolar. Typically these have special structures for transducing some type of physical stimulus (light, sound, temperature, etc.) into electrical activity, no dendrites, and a single axon that conveys the resulting signals into the spinal cord or brain. ↑ Source: Mayer and Harzsch, BMC Evolutionary Biology 2007. Martin, John Harry (2003). Neuroanatomy. McGraw-Hill Professional. ISBN 0-07-138183-X. Bullock, Theodore H.; G. Adrian Horridge (1965). Structure and Function in the Nervous Systems of Invertebrates: Volume II. W. H. Freeman.